Free from artificial colours or preservatives.Knorr Aromat seasoning is a finely balanced blend of herbs and spices, carefully selected to bring out the best in your cooking. 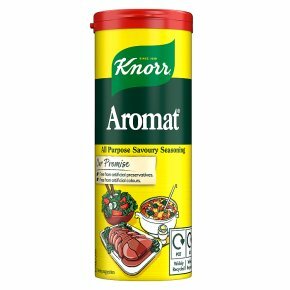 You can use Knorr Aromat seasoning just like salt and pepper - either in the kitchen whilst cooking or on the table as a condiment. Try it with vegetables, rice, pasta, salads or rub into meat or poultry before roasting or grilling.